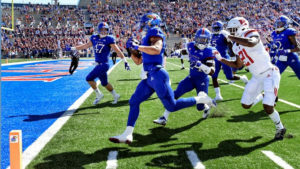 LAWRENCE (AP) — Bryce Torneden and Mike Lee reach returned interceptions for touchdowns and Kansas’ defense wound up with three picks and recovered three fumbles en route to a 55-14 win over Rutgers on Saturday, the Jayhawks’ first back-to-back wins over FBS opponents since 2009. Turnovers plagued the Scarlet Knights from the start as Torneden jumped in front of an Artur Sitkowski pass on Rutgers’ second drive and returned it 39 yards for the score. Torneden was there again the next time out, recovering a fumble by Jonathan Hilliman that set up a field goal. Both Miles Kendrick and Peyton Bender saw time at quarterback for Kansas, but Kendrick carved out a much larger role then in weeks prior thanks to some strong play. He was responsible for the Jayhawks’ lone score through the air, a goal-line fade to Jeremiah Booker who lost his shoe while landing in the corner of the end zone. Kendrick also ran for an 8-yard score in the third.